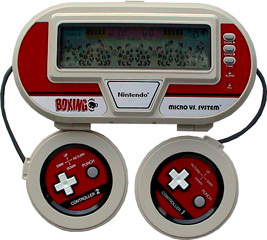 A 2-player boxing game. Each player can punch high and low or dodge. When a boxer takes three hits, they are forced to take a step backwards. When they take three hits on the far side of the screen, they are knocked out. Each boxer has a stamina meter that starts at 50, losing 1 point when punched, 3 points when forced backwards, 5 points for the first knockdown in a round, 6 for the second knockdown and 7 for the third and every knockdown after. There are 9 rounds with no knockdown limit. The game ends when one player is KO'd with zero stamina, or when the players reach the end of the 9th round.